A plate of tiny, deep-fried fish is one of the modest glories of French cooking. And preparation is both simple and amusing. You will need to arm yourself with a sturdy pot for deep frying, a slotted spoon or spatula, some paper towels, a pie tin and a sheet of parchment paper. As for the fish, choose the smallest you can find. Petite friture, which translates literally as ‘small fry’, covers tiny fish of different varieties that are deep fried and eaten whole. 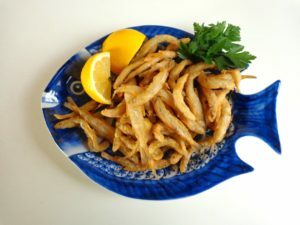 The equivalent term in English is whitebait. The fish are typically 2-3 inches (5-8 cm) long. French varieties that are often used include éperlans (smelt), goujons (gudgeon) and ablettes (bleak). In Britain, tiny herring are commonly sold as whitebait. Similar tiny fish may be harder to find in the States outside smelting season. You can use larger fish for this recipe, but you will have to extend the frying time — and the fish cannot be eaten whole. Being in France, it was relatively easy to find the appropriate tiny fish. It took me about 20 minutes to fry up a pound (500 grams) of them, one batch at a time. With a larger pot and more oil, you could do it more quickly. After each batch is fried, it is placed in the oven to keep warm. The fish should be served immediately. The quantites below will serve 2-3 people as a main dish, 4-5 as a starter and 8-10 as as an appetizer at cocktail hour. Rinse the fish in a colander and dry off with paper towels. Place the flour in a paper bag. Add the fish. Shake well. Remove the fish, shaking off any excess flour. They should be lightly coated with flour. Line a large dinner plate with a couple of layers of paper towels. Line a large pie pan with parchment paper. Set both aside. Preheat the oven to gasmark 3 (200 F, 90 C). Heat the oil over high heat in a sturdy pot with deep sides. It should fill the pot about halfway. To tell when the oil is hot enough for frying the fish, add the bread cube. When it turns golden, the oil is ready to receive the fish. Fry the fish in small batches until they turn golden. Don’t be in a hurry — this takes a while. As each batch finishes, remove the fish with a slotted spoon to drain on the paper towels. Sprinkle with salt while still hot. Transfer to the pie pan and place in the oven to keep warm. Repeat until you have fried all the fish, transfering each batch first to the paper towels and then to the pie pan. If the paper towels get too oily, replace them with fresh towels. When all the fish are fried, quarter the lemon or lemons. Place the fish and lemon pieces on a serving platter or individual plates. Decorate with the parsley. Serve piping hot. Serves 2-3 as a main course, 4-5 as a starter, 8-10 as an appetizer at cocktail hour. If you like, you can serve the fish with sauce tartare. In France, this sauce is made by adding finely chopped pickles, capers, tarragon and parsley to homemade mayonnaise.